The autonomous car is currently being intensively discussed and in combination with electric mobility, very often seen as the future of individual transport. In order to achieve this vision, the use of artificial intelligence (AI) technologies is absolutely essential. 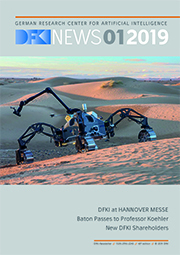 The DFKI is involved in a whole range of activities in which AI technologies for autonomous vehicles are investigated and further developed. In the Competence Center Autonomous Driving (CC AD) all activities of the individual research areas of DFKI in this field are bundled and thus the technological expertise is further developed. The competence centre defines and coordinates public and industrial research projects and is the central communication platform for employees as well as a contact point for external contacts in the field of autonomous driving. The automotive market is facing the biggest change since the invention of the automobile. The expectations of the media and the public regarding autonomous vehicles are very high. Apart from an increase in travel comfort and time for productivity or entertainment, as one knows it from train journeys, autonomous vehicles promise above all however a reduction of traffic accidents. Despite considerable improvements in the passive and active safety of modern passenger cars, there are still more than one million road deaths worldwide today. Since it has been proven that the (human) driver is responsible for the vast majority of these accidents, it is reasonable to conclude that autonomous mobility can save lives. In addition, the technology promises to improve traffic efficiency, i.e. reduce congestion and thus provides both environmental and economic benefits. The role of the vehicle as part of more complex business models will become increasingly important in the future. Mobility services such as Uber are only profitable in the long term if the vehicles do not require drivers. Google (Waymo) is also investing in autonomous vehicles, “so that millions of Americans can spend an average of 1.5 hours a day more online”. In order for German and European suppliers to remain globally competitive and to be able to develop target-oriented innovations, they need new partners and politically clear framework conditions. Although Germany holds more than 50% of the world's patents for autonomous driving, it shows deficits in practical implementation compared to other countries. The field of artificial intelligence plays a key role in overcoming the challenges associated with the further development of technology and its verification (acceptance). In particular, machine learning, which enables the vehicle to perceive its environment, plays an essential role. The corresponding models are trained offboard (outside the vehicle) on the basis of huge amounts of data (Big Data) with special procedures (Deep Learning). In addition, training and test drives in virtual environments (Synthetic Data) are essential to prepare the vehicle for rare events.